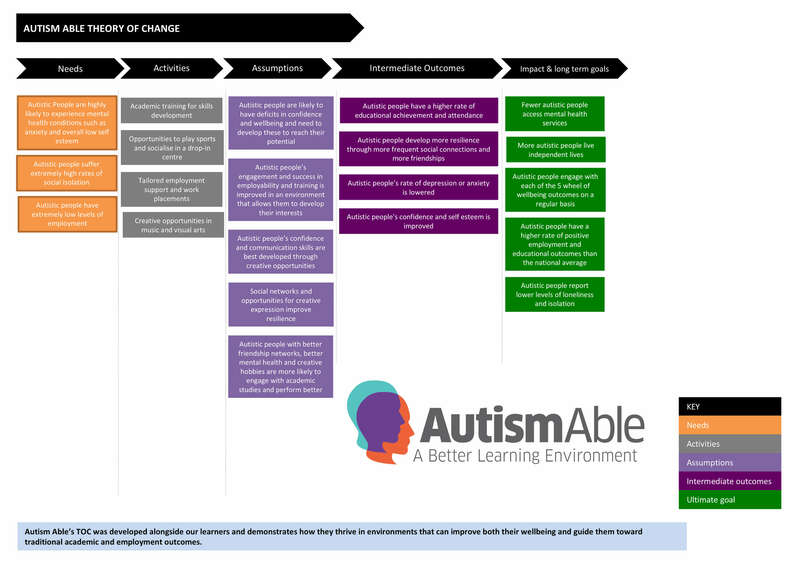 AutismAble uses the Theory of Change model to define our long term goals and to identify necessary preconditions that must occur during planning , participation and evaluation in order to achieve these goals. On March 23rd 2018, Autism Able learners, staff, trustees and volunteers came together for a workshop to develop and finalise our Theory of Change. This is part of a process of evaluating and clarifying the impact of the help we provide to our learners and of adopting the New Philanthropy Capital ‘Four Pillars’ approach to strategy, evaluation and impact measurement. If you are considering helping us fund and improve our services, refer clients to us, or to join us as staff, then our Theory of Change will help sum up how we work and why our approach is important and unique. We believe each component of this work complements one another and creates a range of positive outcomes for learners and service users. We believe the diversity of opportunity we offer makes an individual referred to Autism Able better off than someone in a less varied or more traditional learning institution. Our Theory of Change will help us demonstrate this. Autism Able’s first priority is a learner’s self determination and independence. Each one has the opportunity to curate their learning experience and to pursue their particular interests, which is a crucial part of engaging people with ASC. In line with this philosophy, our Theory of Change was created in collaboration with our learners. We wanted to ensure they felt the same about their experience with us and the services we offer. We wanted to ensure their perspective on how our work has helped them become more fulfilled and created positive change in their lives leads our strategy and development. That way we can agree on how we might continue to develop Autism Able’s offer in future. Here’s how we used a fun collection of artistic and creative activities in order to draw out our learner’s priorities, agree the outcomes that we aim for together, and establish need for our services and demonstrate the causality that leads from our activities to our outcomes. Why do our learners come to Autism Able? What did they do? Why did they come? What did they enjoy? In as much detail as possible, our learners described what they do at Autism Able, what they’ve achieved during their time here and how they spend their time since they joined us. We also asked them to write up how they’d changed and add these as post-it notes: how did they feel? What words would they use to describe themselves? The majority of positive language was associated with our sports, music and wellbeing and talked about confidence, self esteem and social ties. What if our learners didn’t come to AutismAble? What did they do? What how did they feel? These would demonstrate the need our service fulfils but also continue to show our client’s priorities when they access our service. That only one of 30 students said that they would have any social contact at all. That all had felt bored, sad, and bad about themselves at periods in their lives and could draw on this experience when thinking about their lives without Autism Able. That responses emphasised isolation and the negative feelings associated with this. How does the experience of coming to Autism Able help our clients for the future? We asked our clients about their dreams, aspirations and where they would like to be in the future. They then reflected on and created a road-map that combined the positives they had written on in our first step, the negatives they had overcome in our second step. They were asked to think about how each positive might relate to a goal. Words like confidence were re-used again and again – words that were originally attached by post-it note to the feelings our client gets giving a performance onstage were re-used to goals such as ‘getting a job’ or getting a girlfriend. We have learned how our wellbeing activities are extremely important to our clients and how participating in these helps them to also succeed in study and employment. We want to be able to show funders, donors and potential learners this fact in clear terms. So we will develop our impact measurement and KPI measurement to fit our Theory Of Change. The number of positive friendships each of our clients gains since joining should be reported on so that we can show, statistically, how joining us creates new friendships. Our learners’ loneliness levels should be measured using the Campaign To End Loneliness metric tool. We will endeavour to demonstrate that participation in our wellbeing activities improves wellbeing, that more friendships improves wellbeing and that learners with improved wellbeing attend courses more frequently, achieve better grades and better employment outcomes. Autism Able’s TOC was developed alongside our learners and demonstrates how they thrive in environments that can improve both their wellbeing and guide them toward traditional academic and employment outcomes.